Administered through an independant company, Compliance Concepts, Inc. (CCI), the Emory Trust Line is a toll-free, 24-hour, 7 day-a-week, telephone resource that allows you to report potential ethical, legal, and/or business conduct violations or concerns at Emory in a confidential manner. Additionally, business officers and other employees should report all complaints received regarding these matters. Callers may remain anonymous if they so choose. 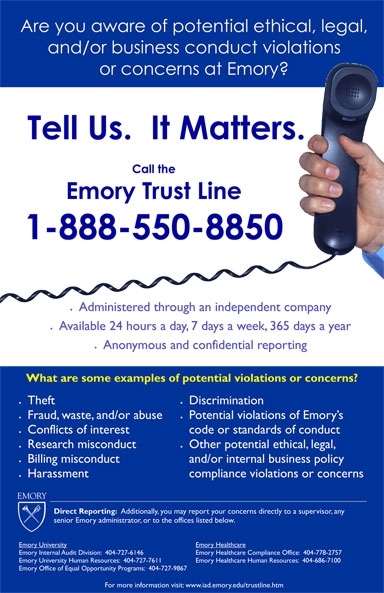 The Emory Trust Line, 1-888-550-8850, is designed to give you an avenue for reporting serious concerns and violations to Emory's management in a confidential manner, without fear of reprisal. Emory employees may also report their knowledge of potential violations or concerns to the Chief Audit Officer at 404-727-6146, the Director of the Office of Research Compliance at 404-727-2398, the Chief Compliance Officer for Emory Healthcare at 404-778-2186, or directly to any senior level administrator. The independent service (provided by Compliance Concepts, Inc.) is staffed by an experienced team of full-time Compliance Risk Specialists (CRSs) trained in interviewing techniques and documenting information by phone. Each CRS executes a Confidentiality and Non-Disclosure Agreement as part of their employment with CCI. The service is available to all faculty and staff employed by Emory University and Emory Healthcare. Other potential ethical, legal, and/or internal business compliance violations or concerns. You should not use the Emory Trust Line for emergency situations. We encourage you to direct emergency calls to Security or the Police. When you call, a CRS will gather specific information from you related to the reported activity. You may be asked additional questions. If you wish to remain anonymous, the CRS will assign you a unique reference code that will be used throughout the investigative process. At the end of the call, the CRS will give you a time to call back to find out the status of your report. If you choose to identify yourself during the call, the appropriate university contact person may talk to you directly about your concern. Within 24 hours (and possibly sooner depending on the level of urgency associated with the call), a detailed writted report will be prepared by the CRS and forwarded to the Emory contact person, who will ensure that the information is provided to the specific department that will conduct an appropriate and prompt inquiry. When appropriate, the results of the investigation will be relayed back to the CRS and communicated to you. Special reports will be provided to the Board of Trustees Audit Committee. Emory will not retaliate against any employee who reports any concern in good faith. At no time will your call to the Emory Trust Line be traced or tape recorded. In addition, Emory will not attempt to determine the identity of any anonymous caller. However, please be mindful that the information you provide may be the basis for an investigation by Emory University, and that your identity may be inadvertently discovered during the course of that investigation. As previously explained, Emory will not retaliate against any employee for reporting any concern in good faith. If you choose to remain anonymous, please be sure to provide as much detail as possible. Deaf or hearing impaired individuals should use a teletype phone to call the Emory Trust Line. Non-English-speaking callers will be forwarded a Language Line Interpreter to help with interpretation by calling the Emory Trust Line, toll free, 24-hour, 7 day-a-week, at 1-888-550-8850.